Who doesn’t like a kitchen space that is open, bright, completely ventilated, and makes for a comfortable cooking and dining spaces for the family? 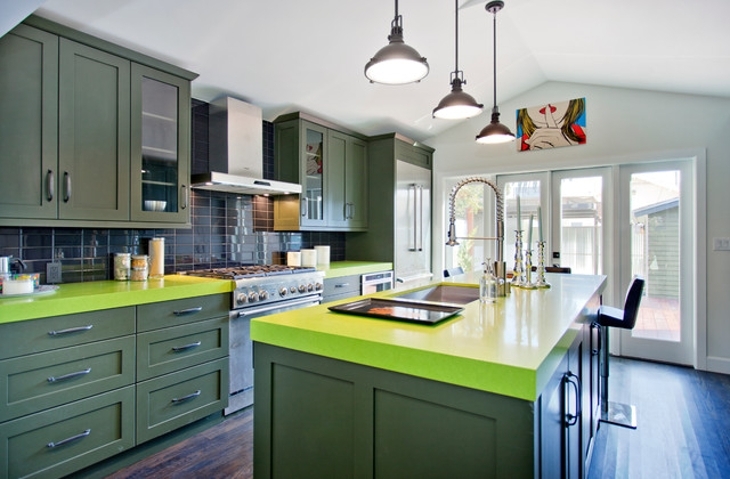 Green color shades, in this regard, work well for coloring the cabinets, walls, countertops and even the kitchen floors. Green color being close to nature offers a reassuring delight and eco-friendly refurbishments make the kitchen a greener and a fun place to work. 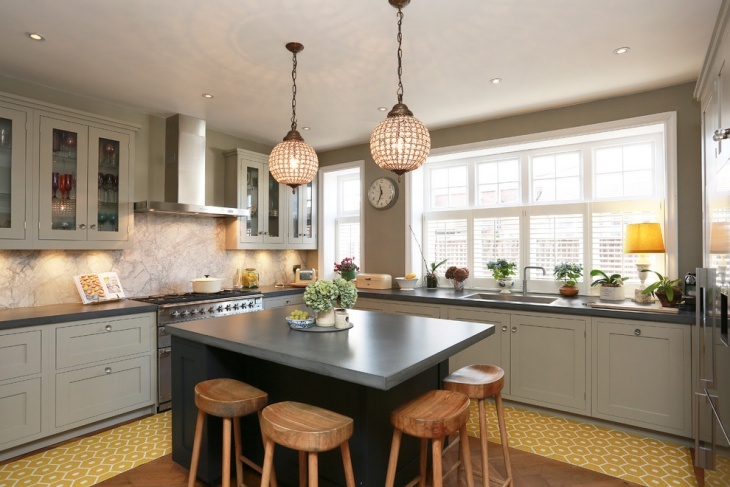 The closed and dark kitchens are not functionally supportive and hence it is best to refurbish such kitchens into brighter areas with windows, enlarged spaces and minimalist furniture settings for a close to natural environment. 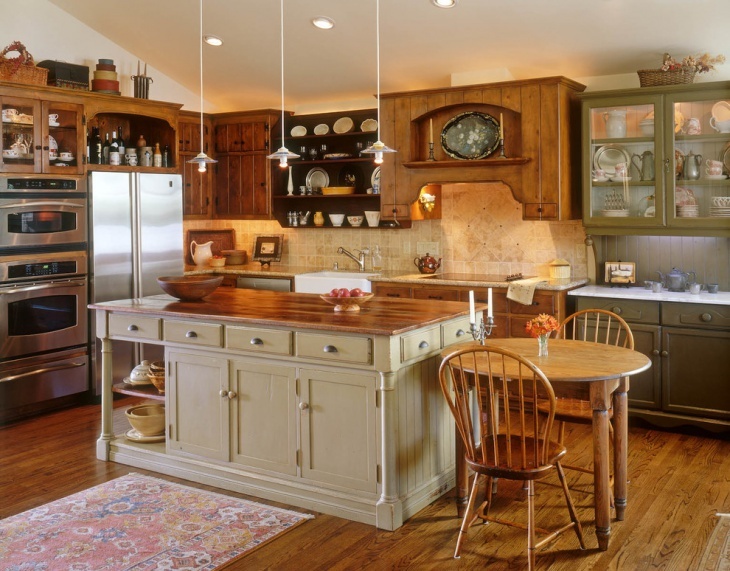 The traditional kitchen workstations with wooden cabinets, required appliances, and a small kitchen island can facilitate ease if adjacent to breakfast areas. 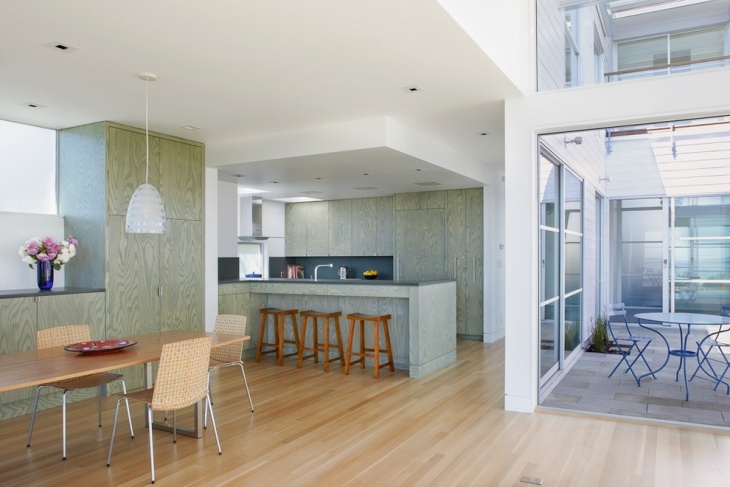 The green and eco-friendly ways defining today’s contemporary kitchens include its complete insulation. The electricity provisions in this Green Point Rated Kitchens are facilitated using solar panels and the other natural resources like water are conserved using rain water catchment areas in the kitchen premises. 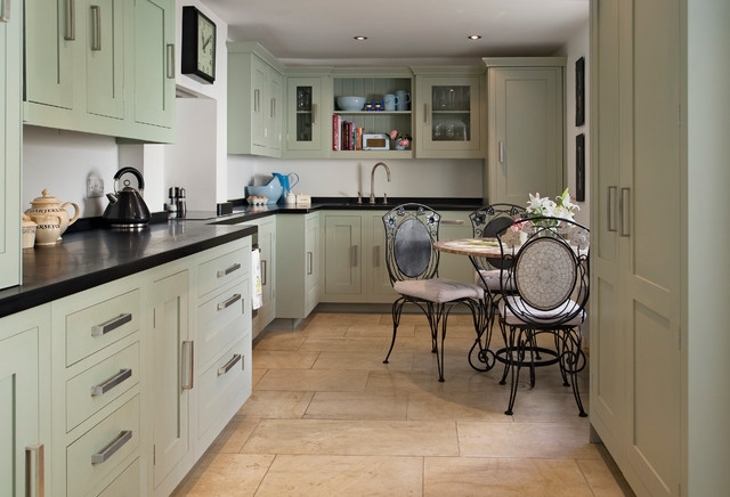 The Dark green pine cabinets look rich and classic in a kitchen. 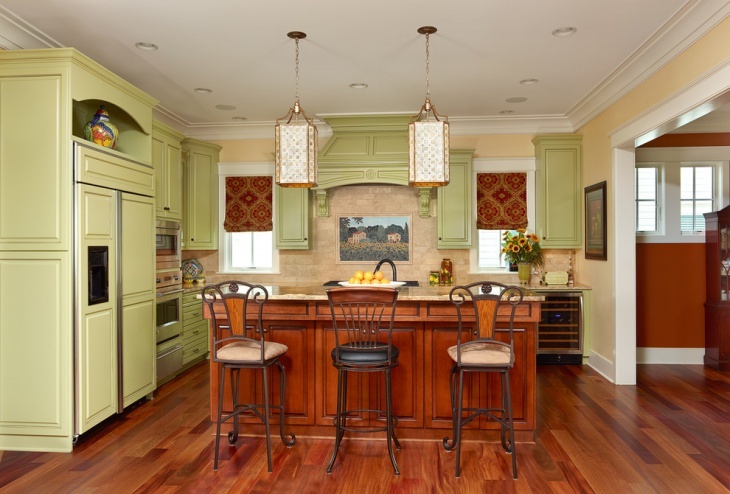 A large pine cabinet by the side of a small kitchen island and a gallery kitchen look with tall window panels makes the kitchen bright and dazzling. The open and closed shelves and space reserved for the Microwave ovens within the cabinet allows proper space utilization in a small kitchen. 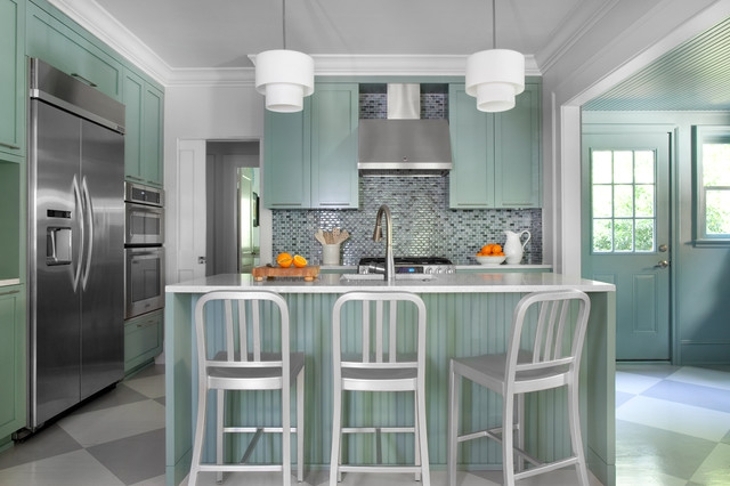 The Remodeling of a kitchen is a herculean task and often the decor and architecture reflects in the form of a lively ambiance. 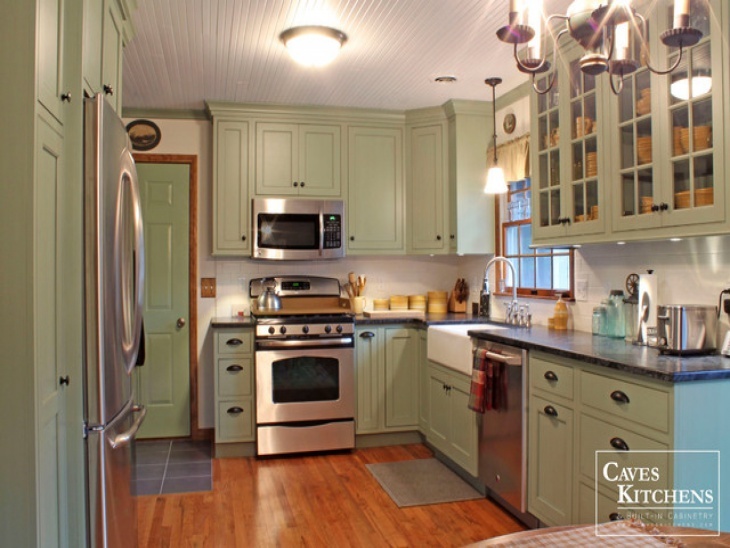 The green cabinets with drawers gel well with the granite countertops. 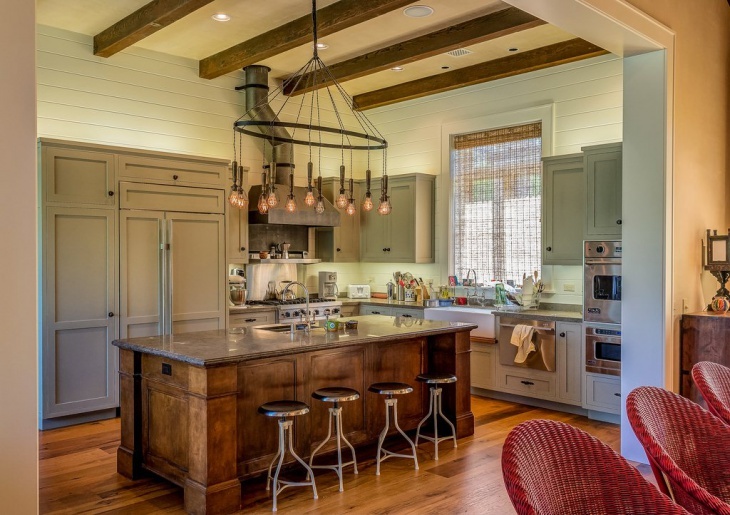 The beautiful pendant lighting over the kitchen island with seating stool makes cooking and chatting convenient and fun. 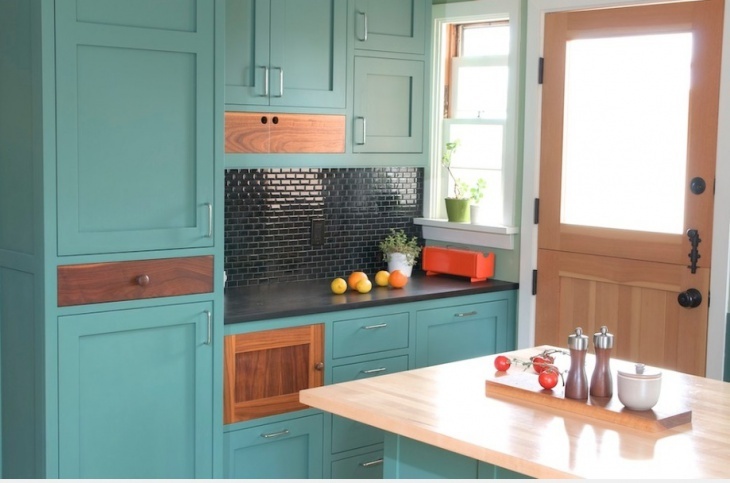 With the consistency of shutter doors for both the base and mounted shelves of the lime green cabinets, the kitchen gets a neat and uncluttered look. 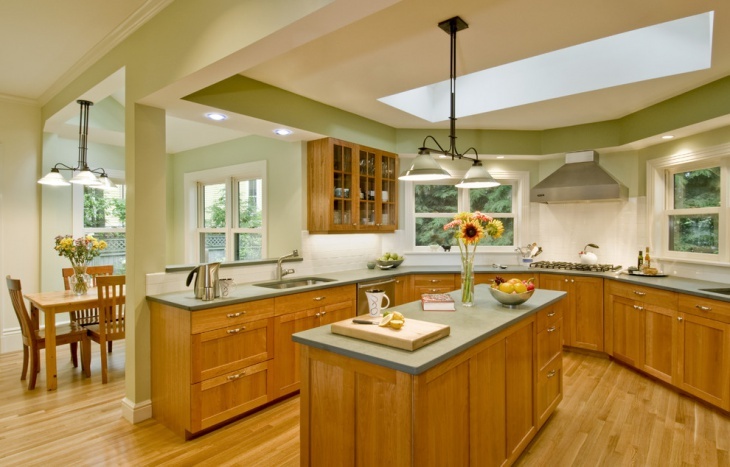 A clean kitchen with plantation and proper lighting also provides a healthy ambiance for cooking healthy food. 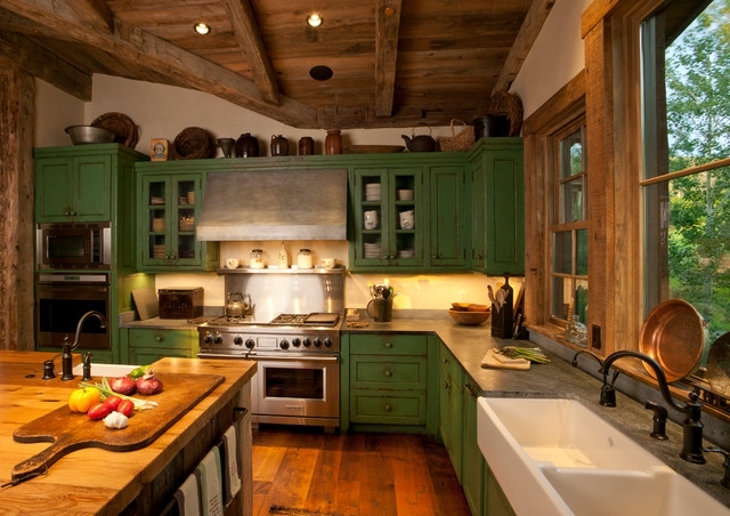 The antique and rustic look of a countryside kitchen can also be adopted in a vintage kitchen. 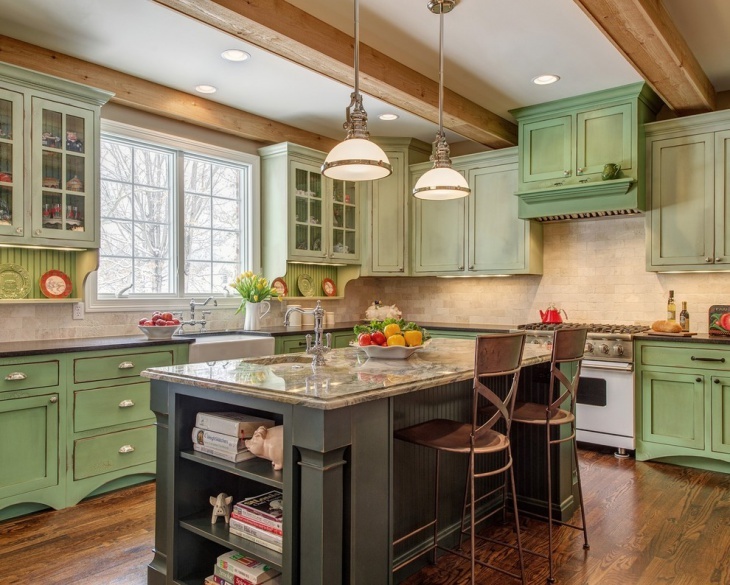 The wooden and green colors make a good contrast combination for the kitchen. A number of cabinets provide enough storage space. 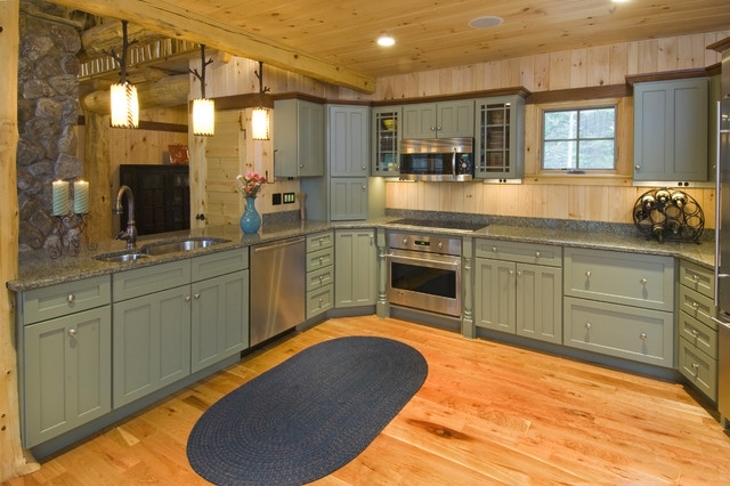 Proper space provisions can be customized for kitchen appliances like Refrigerators and ovens. 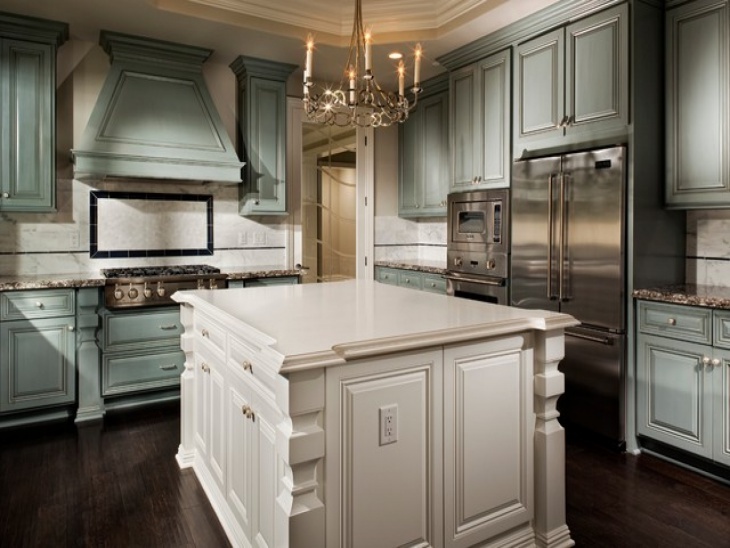 Light colors like green, sky blue, pink definitely intensify the brightness of the kitchen. 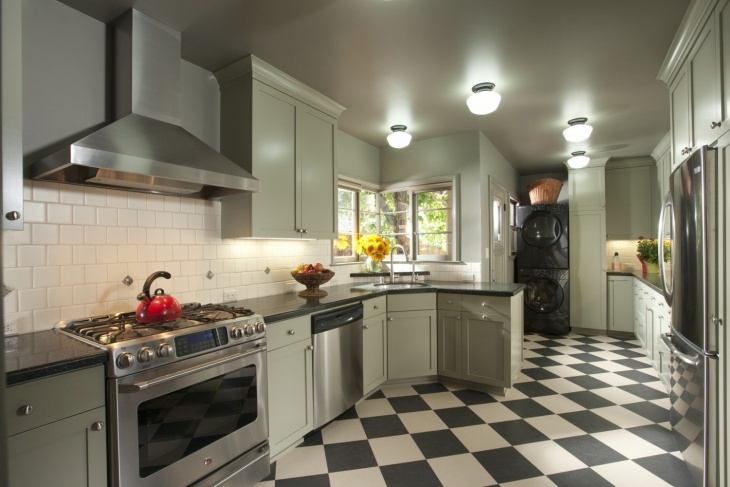 A tiled kitchen looks like a better alternative to paint in orders to have limited chances of staining and also it is lower in terms of maintenance. 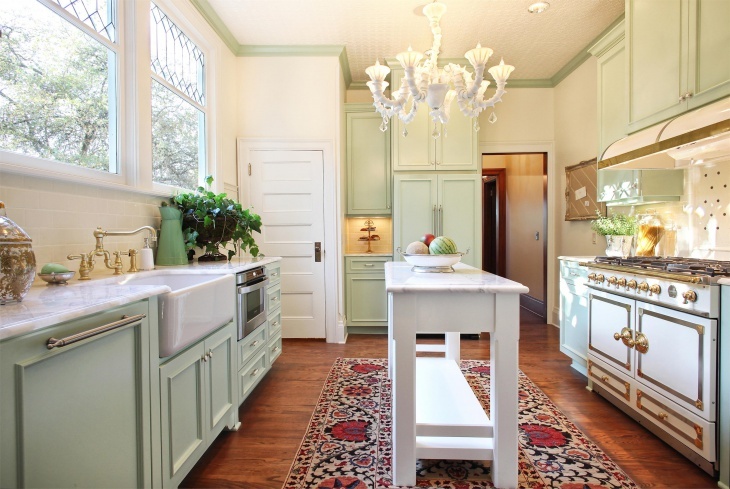 The chandeliers add to the glamor quotient of the kitchen. 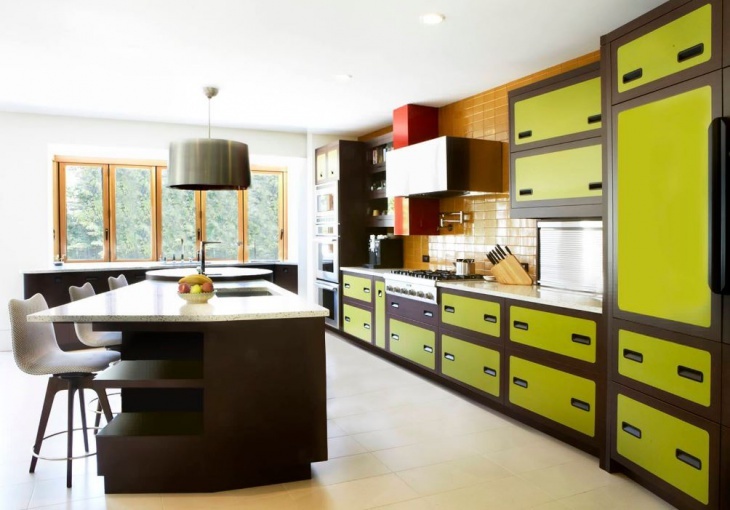 A lovely kitchen can be modernized with designer ceiling lights and the right choice of color palettes for the worktops. Some uniqueness is also exhibited with the seating arrangements and stylized shelved cabinets. Swiveling baskets at the base offer higher convenience in lifting things. The cabinets neatly structured in the right dimensions at the base and on the walls help to fit in the stainless steel appliances well in between. The kitchen with small islands can definitely give it a magical touch using the candle chandeliers giving the family gatherings a candle light dinner feel. 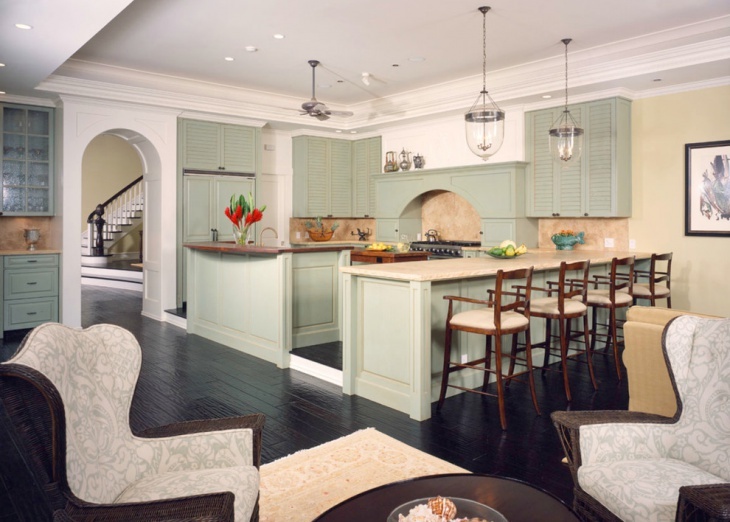 The interiors and the architecture of the kitchen must be comforting. 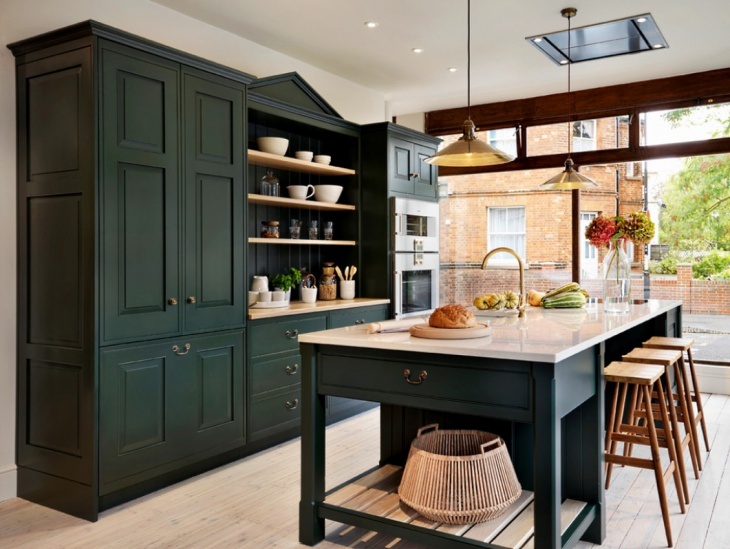 Proper green shelved cabinets, antique lights, Cherry Island, high stool make for a brilliant award winning kitchen design. Also, the pointed edge cabinets need to be crown molded to avoid accidental bumping and hurting. The green kitchens are eco-friendly, tasteful in terms of architecture are the best in class in the modern times and are worth a buy. What do you think?